In the aftermath of the January 12 deadly attacks in Istanbul, President Recep Tayyip Erdoğan stressed that “Turkey is the primary target of all terror organizations operating in the region, because we are combating all of them without discrimination”. Despite these statements, many doubts persist on Turkey’s real involvement in the fight against Daesh. Is there a “Turkey’s Dance with the Islamic State” or is “Turkey step [ping] up its fight against Islamic State”?Addressing this puzzling debate is the main purpose of this article. In order to do so, I will consider the evidences of Turkey’s both supporting and fighting Daesh. This attitude corresponds to the ambiguity of Erdoğan’s strategy towards the Syrian geopolitical scenario. Both external and internal factors might help to clarify this issue. According to this thesis there are several evidences that confirm the supporting role of Turkey towards Daesh. 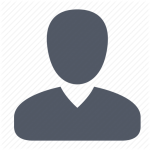 This is clearly an undercover support whose forms may vary widely. It is claimed that Turkey has supported Daesh in two different ways: through offering logistical facilities using its “porous borders that allow fighters and weapons to pass unhindered”, and through the creation of an indirect financing system founded on the oil-and artifacts-smuggling routes. ECONOMIC SUPPORT. 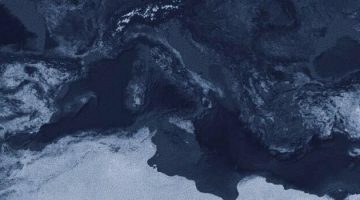 On November 24and December 2, 2015,President Putin and Russian Deputy Defense Minister Anatoly Ivanovich Antonov released two reports that identified an “irrefutable” Turkish involvement in oil smuggling across the Syrian border through three main routes “from areas controlled by ‘armed gangs’”. An even worse accusation was present in the reports, stating that: “President Erdoğan and his family were personally profiting from the theft of oil from Syria”. Washington and Ankara immediately denied any Turkish involvement. Amos Hochstein, U.S. special envoy and coordinator for international energy affairs, commented that “the amount of oil being smuggled is extremely low and has decreased over time and is of no significance from a volume perspective – both volume of oil and volume of revenue”. According to US statements, this is due to the fact that the coalition’s airstrikes have blown up several oil smuggling points, with the result that Syrian oil is only enough to cover the warzone’s needs. Despite this US-Turkey alignment, oil smuggling has been a huge political problem in Turkey since early June 2014, namely when Ali Ediboglu, a representative for the border province of Hatay at the Grand National Assembly, revealed that an estimated amount of 800 million US dollars of stolen Syrian oil was being sold to Turkey by insurgents and terrorists. The Turkish newspaper Taraf Gazetesi also supported Ediboglu’s statements. Furthermore, it has been discovered that “over a hundred oil tankers belonged to the Turkish Bayrak Company”. The name of that company is not less important: indeed, it is led by Berat Albayrak, Erdoğan’s son-in-law and Minister of Energy and Natural Resources under Prime Minister Davutoglu since the disputed Turkish general elections of the last November. Related to this issue, in early December 2015, the Financial Times published probably the most comprehensive analysis on the Syrian stolen oil smuggling(see Fig. 1). The most prominent producing regions of IS’ oil are Deir Ezzor province (eastern Syria), and Qayyara field near Mosul (northern Iraq). According to Financial Times, once extracted “the group sells most of its crude directly to independent traders at the oil fields. In a highly organized system, Syrian and Iraqi buyers go directly to the oil fields with their trucks to buy crude”. This crude oil has to be refined before entering in the smuggling cross-border trade. The most important refineries in IS-controlled Syria produce petrol and mazut, a heavy, low quality form of diesel used in generators, in great demand on rebels market in areas without electricity because of its lower prices. Once refined, this oil needs a market to be sold and the Syria-Turkey border is a securitized barrier through which enter the regional trade. The hotspots and methods through which refined oil crosses the Turkish border are several (see Fig. 2). The first attempted smuggling method involved the use of metal tubs or small row boats pulled across the Orontes River towards Turkey’s dealers on the opposite river bank. For the second, smugglers used a pumps system built in cooperation with small border towns like Besaslan. Quoting the Financial Times, “some Syrian and Turkish border towns have co-operated by burying small rubber tubes under the border”. The third method involved smugglers crossing the borders by mule, donkey or horses in the proximity of towns like al-Sarmada and al-Rai to carry small quantities of oil. 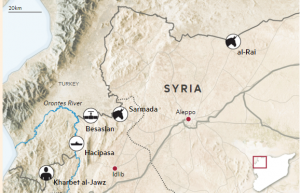 Finally, there is the Kharbet al-Jawz (rebel-held Syria) – Guvecci (Turkey) route, traveled by foot by criminal networks. The geographical hardship of this environment has not completely allowed Turkey’s forces to defeat this entering hotspot. Whether the oil smuggling has to be linked to an Erdoğan’s strategy is not a matter for the Financial Times’ analysis, that limits its research to the description of this phenomenon. But the lack of such an explicit connection should not suggest its absence, but rather invite to a reflection on whether Turkey’s evident blindness to the smugglers crossing its borders can be considered deliberate or not. Together with oil smuggling, there are other elements in the Turkey-IS undercover financial system. Firstly, the artifacts and antiquities illegal market. On February 2015, Simon Cox realized an important interview with an artifacts smuggler who resides in southern Turkey. This interview is considered of a particular importance in order to expose this market’s dynamics. The first rule to this trade is that “to sell looted antiquities you need a middle-man”, as a promoter of market relations between Daesh and collectors. A capable middle-man is a fundamental transmission-knot in the illegal artifacts market based on the relationship between Daesh smugglers and Turkish dealers. Apart from the smuggling of artifacts in itself, one other really important source of financing for Daesh is a peculiar form of taxation for looted works of art that corresponds – more or less – to the 20% of the value of the good. The Washington-based think-tank Foundation for Defense of Democracies released a report on the artifacts financial portfolio led by Daesh. The graph comparing the USD amount of art goods trafficking is particularly interesting. As we can see in Fig. 3, Turkey is a key hub for artifacts smuggling to the US, with an increasing dollar flow between 2010 and 2015. LOGISTICAL FACILITIES. In late January 2015, in an interview released by The Independent, Turkey’s Prime Minister Davutoglu warned that “Turkey is unable to close its 510-mile-long border with Syria, which has been crossed by thousands of foreign jihadi volunteers”. In the same interview Davutoglu admitted his irritation at the way in which “Turkey’s motives and actions are actions are misinterpreted as sympathy for ISIS”. He underlined that Turkey “is looking after 1.5 million Syrian refugees who have fled Assad and 200,000 who have fled ISIS in Syria, in addition to 300,000 Iraqis who have been forced to flee because of ISIS advances”. Inside this 510-miles Syrian-Turkish border, there is a 61-miles border strip that “serves as IS’ window to the world”. This basically corresponds to the Jarablus and Al Rai crossings from Turkey’s Gaziantep to Kilis, a recovered point of the US-Turkey agenda after the recent visit of Vice President Joe Biden to Istanbul. Reality is worse than its institutional description. Fehim Taştekin, a columnist at the Turkish newspaper Radikal, described the borders situation as a risky hotbed for the penetration of weapons and fighters, due to the Turkish officials’ collusion with Daesh. Among the 60,000 people trying to escape Syrian and Russian attacks in the province of Aleppo and amassed on Turkey’s border, there are many “fighters supported by Turkey in Bayirbucak and Aleppo-Azaz areas and foreign Islamic State (IS) militants”. A local source told Al-Monitor that “Controls on roads are insufficient. At Killis, there are two checkpoints that operate at certain hours. But there are scores of other roads you can use to get out of Killis. Sometimes, because of complaints, the police show up and check identities for 10 to 15 minute and leave. There is no serious control”. Furthermore, a complex system of human trafficking (migrants/refugee and fighters) has been implemented, that involves smugglers dealing with Turkish soldiers. According to the same local source, “smugglers make deals with soldiers. They buy them with money”. Through the same hotspots, IS’ militant could enter the Syrian borders with military equipment and could manage the flow of foreign fighters. Is Erdoğan’s Turkey really interested in defeating Daesh? The question that arises from this article is whether Turkey is really interested in defeating Daesh and, if not, why. Turkey’s official position has stressed on the increasing country’s efforts to combat the Daesh threat. Indeed, on August 29, 2015, Turkey has joined the US-led coalition against Daesh in Syria with first fighters jet airstrikes. In light of military operations, a spokesman of the ministry of Foreign Affairs commented that: “Our fighter aircraft, together with warplanes belonging to the coalition, began as of yesterday evening to jointly carry out air operations against [ISIS] targets that also constitute a threat against the security of our country. […]The fight against the terrorist organization is a priority for Turkey”. This is clearly the official position. Indeed, Turkish airstrikes were not concentrated only in defeating Daesh’s infrastructure. In early September 2015, Turkish fighters jets targeted “23 targets belonging to the ‘separatist terrorist organization’”, a periphrasis by which Kurds rebels in southeastern Turkish borders are indicated. Turkish Prime Minister Davutoglu said that southeastern Turkish mountains “will be cleared of terrorists, whatever happens, they will be cleared […] For the peace and unity of our nation, I call on all political parties to stand shoulder-to-shoulder against terrorism”. The fact that the spiraling fighting between the PKK and Turkish government forces has coincided with Ankara’s entry into the military campaign against Daesh is not a coincidence. The Kurdish problem is the most important concern for Erdoğan’s Turkey. Ankara’s fundamental policy vision, in Fehim Taştekin’s words, is very simple: “Turkey used IS as a tool to suppress the Kurds who had declared autonomy in Rojava, the western Kurdistan region of northern Syria”. Airstrikes continued to target Kurds is several other occasion. The last occurred on February 13, 2016, when Turkish aircrafts targeted Kurds rebels in Aleppo province. Lizzie Dearden, columnist for The Independent, pointed out that “Turkey, which is struggling to end a three-decade insurgency on its own territory by Kurdish militants, views them as terrorists and has been sporadically shelling groups fighting along its border”. Apart from the political estimation of the strategic view of Erdoğan’s Turkey, there are several evidences that demonstrate Turkish ambiguities concerning the Syrian powder keg. Probably “Turkey plays a double-sided game” in Syria. In the international geopolitical chessboard, Turkey is walking on a minefield, with a number of traps ready to explode under its steps. The Kurds problem and its geopolitical threat; the dream of Assad’s regime toppling down; the NATO entrapment; and the internal terrorist threat. Indeed, Turkey’s main cities have been targeted by terrorist plots in the last months. The fact that in many occasions its intelligence system has not been able to prevent them and, furthermore, to understand who perpetrated them is another debating point. To conclude, if we cannot openly point out that Erdoğan’s Turkey is accomplice to Daesh position in the Syrian civil war, we cannot neither underestimate the numerous Turkish ambiguities in managing this threat. Taştekin, Fehim. “Why the world questions Turkey’s stance on Islamic State.” Al-Monitor. January 19, 2015. http://bit.ly/1KiH0aG. Ali Ozcan, Nihat. “Turkey’s Dance with the Islamic State.” The Jamestown Foundation. January 22, 2016. http://bit.ly/20VH9bt. Peker, Emre. “Turkey Steps Up Its Fight Against Islamic State.” The Wall Street Journal. November 20, 2015. http://on.wsj.com/210MoD9. Nimmo, Kurt. “Russia presents evidence of turkish support for the Islamic State.” Infowars. December 2, 2015. http://bit.ly/1R11HXH. Nazemroaya, Mahdi Darius. “Turkish-ISIL Oil Trade: Iraq, Iran, Syria, and Russia All Accuse Turkey of Smuggling Oil.” Global Research. December 17, 2015. http://bit.ly/1ocQidG. AFP. “U.S. official: ISIS oil smuggling to Turkey insignificant.”Al-Arabiya. December 5, 2015. http://bit.ly/1Puixhg. Solomon, Erika, Robin Kwong and Steven Bernard. 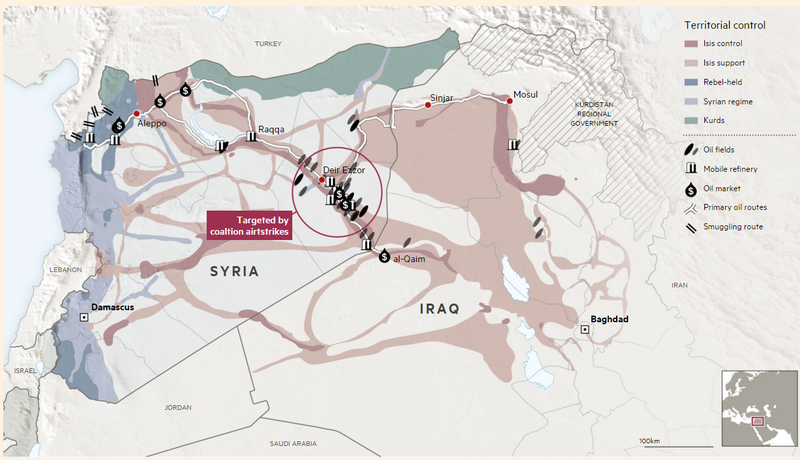 “Inside ISIS Inc: The journey of a barrel of oil.” Financial Times. December 11, 2015. http://bit.ly/1hE62CW. Cox, Simon. “The men who smuggle the loot that funds IS.” BBC. February 17, 2015. http://bbc.in/1A1P47R. Fanusie, Yaya J., and Alexander Joffe. “Monumental Fight. Countering the Islamic State’s Antiquities Trafficking.” Foundation for Defense of Democracies. Washington (November 2015). http://bit.ly/1NHBh9m. Cockburn, Patrick. “War on Isis: Flood of jihadi volunteers to Syria ‘unstoppable’, warns Turkish Prime Minister.” The Independent. January 21, 2015. http://ind.pn/1CgZC3V. 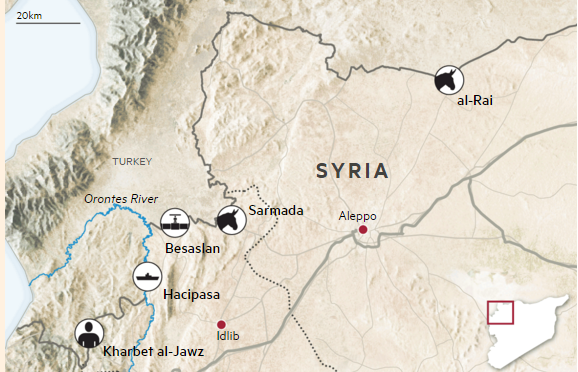 Taştekin, Fehim, “How fighters are filtering across the Syrian-Turkish border.”Al-Monitor. February 11, 2016. http://bit.ly/1Tiydql. AA.VV. “Turkey carries out first air strikes as part of anti-Isis US coalition.”The Guardian. August 29, 2015. http://bit.ly/1KurdmM. Peker, Emre. “Turkey Launches Airstrikes Against Kurdish Rebels.”The Wall Street Journal. September 7, 2015. http://on.wsj.com/20VEEFR. Dearden, Lizzie. “Turkey shells Kurdish fighters in Aleppo province as Bashar al-Assad’s forces continue to advance on rebels.” The Independent. February 13, 2015. http://ind.pn/1ozNhoi.